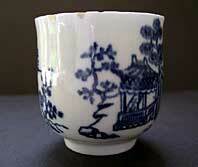 "A fine early Worcester coffee cup transfer printed in underglaze blue with the Man in the Pavilion pattern. 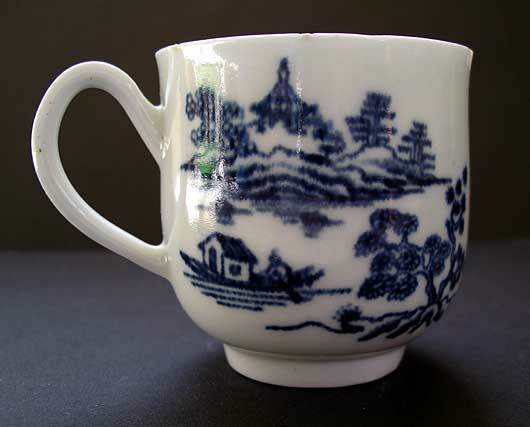 The blue and white design dates from 1757-60 and is considered to be the first of the underglaze blue Worcester printed patterns. 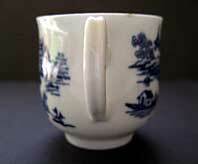 This slender Worcester coffee cup shape, with grooved handle and slightly everted narrow tapering rim, is a delight. A particularly rare find for your very special collection." Antiques Expert Hamilton Bear. 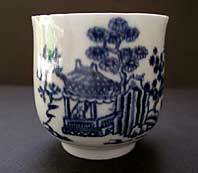 References: See, Branyan, French and Sanden, Worcester Blue and White Porcelain 1751-1790, page 326. The Man in the Pavilion II.B.1. 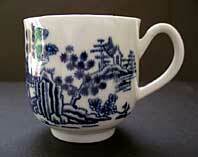 A similar but clobbered cup was sold as part of the Watney Collection. Dimensions: height 56 mm max. 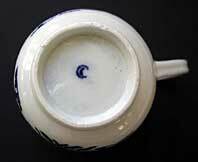 Marks: printed open crescent as illustrated. Condition: An excellent example print. The piece displays well and overall is very good. 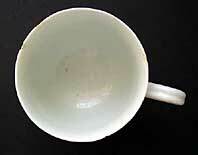 Condition report: There is rim fritting around the very slender narrow rim of the cup. At some point some of these tiny triangular edge chips have been filled, as illustrated.